Molecular dynamics simulations combined with spectroscopic analysis were applied to understand the nature of recognition in molecularly imprinted polymers (MIPs), and for optimizing the MIP formulation. The best monomers for synthesizing imprinted materials for 17β-estradiol (BE2) were selected by evaluating the strength of the template–monomer interaction derived from molecular dynamics simulations. A number of potential functional monomers for BE2 were screened for hydrogen-bonding strength in order to analyze template–monomer interactions favorable for synthesizing noncovalent MIPs, with the simulations revealing that methacrylic acid, 2-(diethylamino)ethyl methacrylate, and methacrylamide provided the highest binding affinity to BE2. These theoretical predictions agree with previously reported results on batch rebinding studies using the corresponding functional monomers for synthesizing a series of MIPs. Molecular analysis such as 1H NMR was used for experimentally confirming the prevalent template–monomer interactions derived from the modeling results. Molecular dynamics simulations indicating monomer dimerization in the prepolymerization solution correlated with the nature of the porogenic solvent, which was confirmed by NMR studies on hydrogen-bonding interactions of methacrylic acid in different solvents. 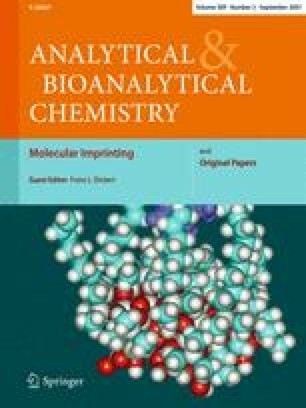 Furthermore, batch rebinding studies revealed that the specific functionalities of the monomers essential to rebinding are retained after polymerization, which proves that the application of computational methods for modeling the prepolymerization solution provides useful information for optimizing real MIP systems. This work was in part supported by the European Commission’s 5th Framework Programme (Quality of Life and Management of Living Resources, no. QLK4-CT2002-02323), and the US Geological Survey (National Water Quality Assessment Program, no. 2002GA30G).